Cover the inside bottom of pot with foil, then sprinkle rooibos (out of tea bag) and brown sugar. Put on a low to medium heat, place rice strainer with fish inside. Cover strainer with a lid and wrap entire top with foil, making sure NO SMOKE ESCAPES. Once a good smoke is accomplished allow to smoke on the stove for 5 minutes before removing off the heat while still covered. Keep covered off heat for a further 10 minutes. Remove fish from smoke and allow to cool off at room temperature. Squeeze through a fine strainer into a bowl the juice from the leftover segmented oranges and grapefruit. In the bowl of freshly squeezed juices, slowly and gradually pour in olive oil, whilst whisking continuously until all the oil is whisked in. Finely slice fennel bulbs and place sliced fennel in a large bowl, gradually drizzle with orange and grapefruit dressing and season with salt and pepper. Mix through and make sure all the fennel is lightly coated with dressing. 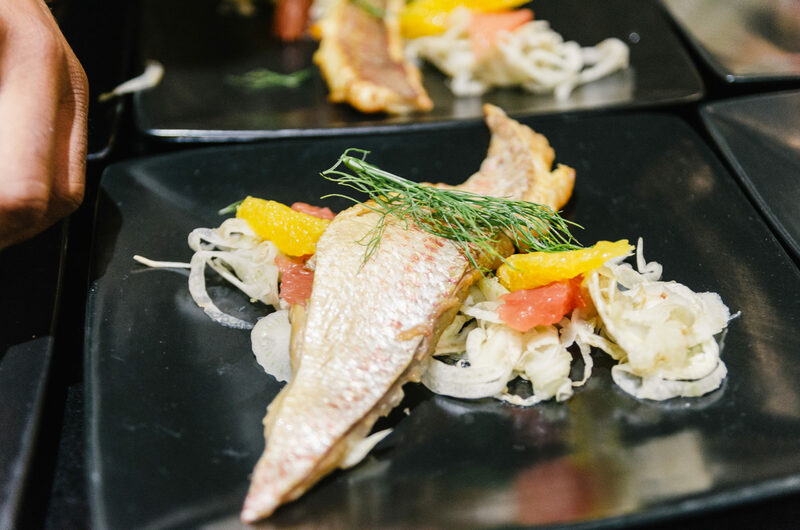 Place a small handful of dressed fennel in a salad bowl, place segments of orange and grapefruit in and around the fennel place smoked fish on top and enjoy!